To download these documents a PDF reader is required. Most computers already have this installed but if you do not have it, please click below to download a free version from Adobe. HMS Tern remained in service until 1957. In preparation to return the land to farming use, many buildings were demolished; in fact holes for explosive charges were drilled to blow-up the Control Tower, the most significant building on the site. Fortunately, the Community Council was just in time to halt execution. Beside the control tower, many buildings remain either as ruins or reused for agricultural purposes. Some 12 acres now belong to the Orkney Islands Council. The Birsay Heritage Trust is to take the lead in preserving the remains and interpreting them to the public as a memorial to those who defended our freedom and as a prayer that this land need nevermore be used in war. The air station at Twatt , the HMS Tern, as seen from the NW, from Loons Road. The Control Tower is the leftmost building, and the square building with two windows showing near the centre of the photo once housed an electricity generator. We hope this may become a museum for aircraft memorabilia. Many other remains show on the map. Keelylang is the distant hilltop and the thin thread of water is an edge view of the Loch of Isbister. The lumps and bumps on the far side of the loch are remains of explosive stores. Inside there are about half a dozen small rooms or chambers that served various aspects of command, coordination and communication. However, all equipment, fittings and hardware had been ripped out, and the wall and ceiling finishes are damaged and deteriorated. Despite the discouraging appearance, the Trust sponsored professional engineering surveys which found the structure still sound, although obviously considerable work is needed to prevent further decline and to make the building safe for public use. Not surprisingly after fifty years standing open without doors or windows, the place was filled with an ample supply of mud and pigeon and animal dirt. In fact, even entry was difficult, because all the tons of stone chips that had covered the roof of the ground floor during the war had been pushed into the passageway between the blast wall and the doors. The Trust's first project was to have a miniature digger and manpower remove the debris. Once the passage was open, some of the Trustees aided by real friends did the dirty work inside (May 2009). Volunteers then fitted doors and window covers and repaired roof leaks to protect the interior from further damage. August 2010, we were far enough along to show off this unique survivor of WW II to public officials and citizens actively interested in celebrating our heritage. Open House for Trustees and ODIN members, Aug.2010. The Clean-Out committee, May, 2009. At the end of World War II the main emotions were those of relief and of the urgent need to rebuild Britain, in both the physical and the social senses. Now, half a century later, we realise how much we owe those who fought the wars. The maps below show the airfield as it was at the end of the war. A modern O.S. map for Dounby (or Google Satellite) shows an outline of all the runways and taxi-ways (in fact, the access road was a taxi-way), standing remains and the sites of buildings now gone. This means the Control Tower can be preserved within much of the original context to provide a living reminder of the contribution our parish made to the extraordinary effort of World Wars. Birsay Heritage Trust seeks to accomplish this goal as a community project drawing upon all the various people and groups interested in Orkney's heritage. 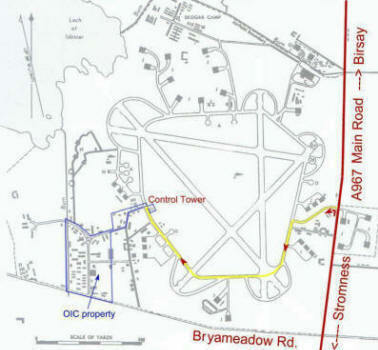 To this end the Orkney Islands Council, the owners of the Control Tower and some adjacent remains, has granted permission for BHT to pursue this goal. Besides the initial clean-up and repairs mentioned above, BHT informed Historic Scotland of the importance of the airfield and especially the Control Tower. Historic Scotland responded by awarding 'Grade-B Listing' to the Tower, and C-Listing to some of the other remains. (Buildings 'listed' by Historic Scotland are granted statutory protection, and renovations or modifications must meet Historic Scotland approval.) Historic Scotland support is important because it demonstrates to sponsors and donors that the site is significant and that repairs will be properly done. Birsay Heritage Trust hopes to gather funding to preserve the structural integrity, replace the doors and windows, install electricity and lighting, restore access to the upper stories of the tower and finish the interior so that it is safe and suitable for displays. The building has a number of interesting features, such as the Faraday room, the blast wall and a grand view from the flight control deck. 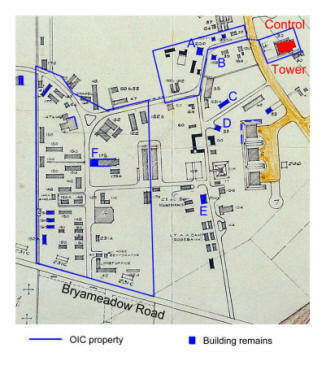 We would also like to identify the foundation and remains of other buildings on the Council's property. Further development depends on community participation. A.R.G.O.S, Aircraft Research Group of Orkney and Shetland (Website), have been active discovering crash sites and recovering or at least identifying remains. They have gathered quite a collection both of knowledge and of artefacts. It would be appropriate to adapt the old generator station as a museum or display area. In September 2007 Birsay Heritage Trust hosted a model aircraft display that was very well attended; this may be an example of the kind of community special activity suitable for the airfield. Beyond the Air Station boundaries there are about a score of related wartime remains, including the two dummy airfields mentioned earlier, the sites of the Fighter Direction School radar and one of the Chain Home Low radars (both on the north coast of Birsay), search light stations and their camps, and so on. The Trust has prepared a map showing the locations. Walking tours are popular here, and a marked trail would make an interesting community project. Click here to see map as Web Page or Click here to view as PDF. So far there are about three score of sites known, but some are known from records only. More Information, Please. One of the functions of a website is to seek input from the public concerning their wartime experiences, location of additional sites and descriptions of them years ago, and to capture as much from living memory as we can. CONTACTS. Tommy Matches is Birsay Heritage's liaison member with ODIN, the Orkney Defence Interest group, or Keith Johnson, Birsay Heritage Trust Chairman. They can be reached through our convenient Guest Book page.